Can you believe it, I started my blog here on 5/9/2008. Things have changed a lot and it really is an exciting time in embroidery. I remember when I started that I wondered if I could come up with 3 ideas for blogs. Somehow, I have managed nearly every other week for that long. 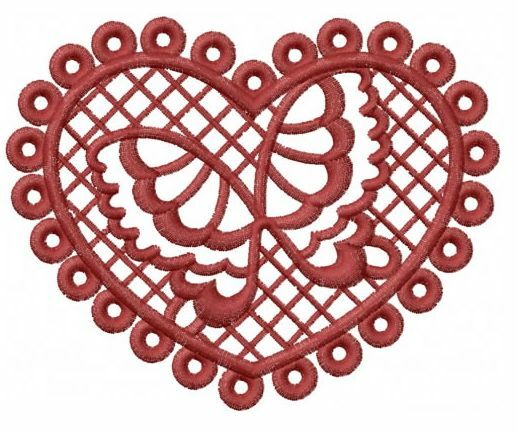 I recall being worried when I first tried free standing lace (blog) (fsl). I figured it would be some sort of disaster but it turned out lovely. I did not do this particular fsl, but I believe with a little effort, it can be done! 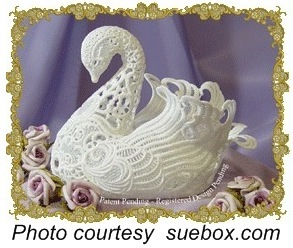 Regular fsl just requires rinsing and drying of the lace, this Swan does require some starch. How beautiful it is. 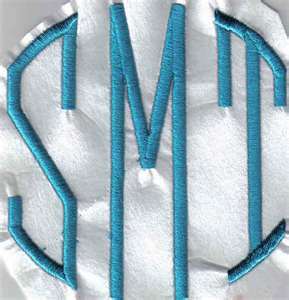 Later, I went into my monogram (blog) period which I found to be very fun and my creativity even surprised me. I created several interesting monograms. Here is one in which I used 'foam', the kind you can get at any fabric store. It is pliable and available in so many wonderful colors. I cannot forget the time I tried 'Candlewicking (blog).' 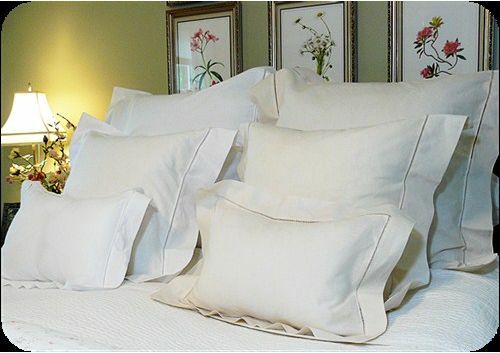 Normal Candlewicking is done with heavy cording on fabrics from burlap to fine linen. The original method is shown here. 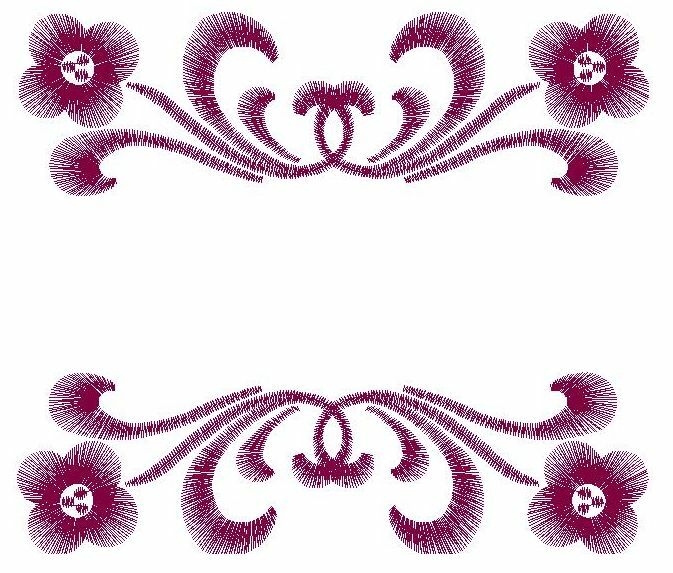 Embroidery uses a multi-stitch method to create the density required to be worthy of such a name. 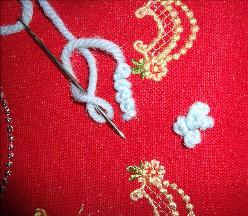 This photo shows a hand method and the 'beads' in the arch are the machine generated stitches. Here is a Candlewicking Freebie - Just in time for the Summer Season. This would be excellent on a Pillow Sham! Thank you for Five Wonderful Years. I sincerely hope you were able to learn and use some of my ideas. I wish I could talk with each one of you in person and learn from YOU! We all have something to share, please add your comments in the area below. I look forward to many blogs to come. To be sure, putting a site with all the supporting people and resources, is costly. I hope you do find opportunities to buy where you learn and share. You have my deepest appreciation. And, HERE IS MY GIFT TO YOU! 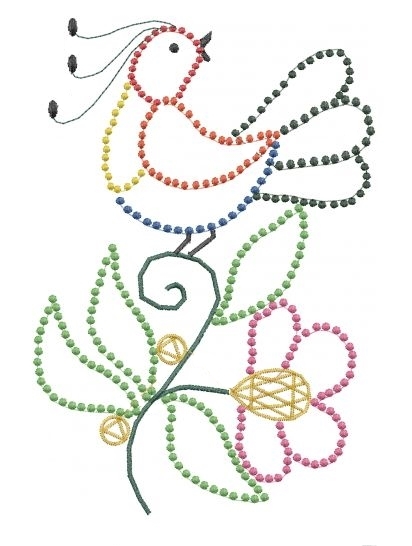 If you have ever considered selling your embroidery projects, if you think you might be in a position to make a profit, this spreadsheet is for YOU. My Embroidery Cost Analysis Kit is on sale! For one week only, for my readers, this spreadsheet is half price. It comes with instructions and a worksheet that works with Excel or Apache Open Office, Calc. Open Office is a FREE and complete software very comparable MicroSoft Office. Thank you again. I love doing this blog and I hope you enjoy reading it. Tell a friend, share the fun. Happy Mother's Day to all. Being a mother is challenging and I would not trade it for the world. Favorite quote for mothers - I did the best child raising before I had children.